Information Systems as a discipline has generated thousands of research papers, yet the practice still suffers from poor-quality applications. 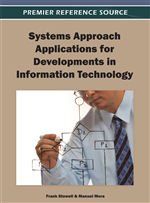 This paper evaluates the current state of application development, finding practice wanting in a number of areas. Changes recommended to fix historical shortcomings include improved management attention to risk management, testing, and detailed work practices. In addition, for industry’s move to services orientation, recommended changes include development of usable interfaces and a view of applications as embedded in the larger business services in which they function. These business services relate to both services provided to parent-organization customers as well as services provided by the information technology organization to its constituents. Because of this shift toward service orientation, more emphasis on usability, applications, testing, and improvement of underlying process quality are needed. The shift to services can be facilitated by adopting tenets of IT service management and user-centered design and by attending to service delivery during application development. The most common way of thinking of the SDLC is the waterfall model within which phases of activity are defined based on the thought processes required to conduct the activities (see Figure 1) (Royce, 1972). Output of each phase is input to the next phase. Phases historically included the following with the key focus in parentheses: feasibility (readiness), analysis (what), design (how), detailed design (how), coding and unit testing (technology), testing (correctness), and implementation (transition to operation). On-going maintenance accounts for about 80% of an application’s life cycle cost and follows each phase but with a narrower scope than the whole application. In this model, application development ceases at implementation with little attention to use of the application in its various contexts.